Bonaventure was instrumental in procuring the election of Pope Gregory X, who rewarded him with the title of Cardinal Bishop of Albano, and insisted on his presence at the great Second Council of Lyon in 1274. 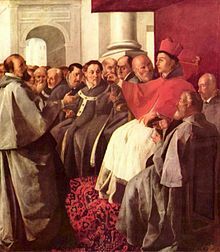 There, after his significant contributions led to a union of the Greek and Latin churches, Bonaventure died suddenly and in suspicious circumstances. The 1913 edition of the Catholic Encyclopedia has citations that suggest he was poisoned, but no mention is made of this in the 2003 second edition of the New Catholic Encyclopedia. The only extant relic of the saint is the arm and hand with which he wrote his Commentary on the Sentences, which is now conserved at Bagnoregio, in the parish church of St. Nicholas. 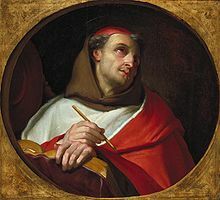 Bonaventure, however, is not only a meditative thinker, whose works may form good manuals of devotion; he is a dogmatic theologian of high rank, and on all the disputed questions of scholastic thought, such as universals, matter, seminal reasons, the principle of individuation, or the intellectus agens, he gives weighty and well-reasoned decisions. He agrees with Saint Albert the Great in regarding theology as a practical science; its truths, according to his view, are peculiarly adapted to influence the affections. He discusses very carefully the nature and meaning of the divine attributes; considers universals to be the ideal forms pre-existing in the divine mind according to which things were shaped; holds matter to be pure potentiality that receives individual being and determinateness from the formative power of God, acting according to the ideas; and finally maintains that the agent intellect has no separate existence. On these and on many other points of scholastic philosophy the "Seraphic Doctor" exhibits a combination of subtlety and moderation, which makes his works particularly valuable. The Life of Christ translated and edited by William Henry Hutchings, 1881. Herbermann, Charles, ed. (1913). "St. Bonaventure" . Catholic Encyclopedia. New York: Robert Appleton Company. One or more of the preceding sentences incorporates text from a publication now in the public domain: Chisholm, Hugh, ed. (1911). "Bonaventura, Saint" . Encyclopædia Britannica. 4 (11th ed.). Cambridge University Press. pp. 197–198.